“Free Fry Day” promotion gives customers $5 toward the delivery of any fry item from local restaurants. The one-day-only promotion provides users $5 off delivery orders of $20 or more to go toward the purchase of any fry item on the menu of available restaurant partners. 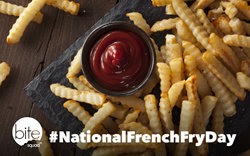 Bite Squad, the national restaurant food delivery service, will celebrate National French Fry Day, Friday, July 13, with Free Fry-Day. * The one-day-only promotion provides users $5 off delivery orders of $20 or more to go toward the purchase of any fry item on the menu of available restaurant partners. All markets Bite Squad services are participating in the Free Fry-Day promotion. To redeem the Free Fry-Day discount, customers may select any fry item from any available restaurant menu to add to their cart prior to checkout, then enter code FRYDAY for the $5 discount. For a listing of available restaurants in their area, customers can visit http://www.bitesquad.com. *Fine print: Enter code FRYDAY at checkout for discount. Valid for $5 off orders of $20 (subtotal) or more on 7/13/2018 only. Not valid towards tax or tip. One per household. Cannot be combined with any other offer or discount. Bite Squad is a leading independent provider of online and mobile food delivery services in the United States. Founded in 2012, in Minneapolis, Minnesota, Bite Squad partners with more than 10,000 restaurants across more than 40 metropolitan areas in 16 states, to deliver fresh food straight to the customer’s door, quickly and hassle-free. To learn more about Bite Squad or to download the top-rated Bite Squad mobile apps, visit bitesquad.com.